You must be a member of the Rome Art Galleries and Studios Group to attend this activity. Would you like to join this group? The exhibition revolves around one of the most emblematic paintings in the history of the National Galleries collection: the Vision of Saint Andrea Corsini by Guido Reni , commissioned by Corsini for the canonization of the saint lived in the fourteenth century, which took place in Protected content the pontificate of Urbano VIII Barberini. The masterpiece of Reni, now in the Uffizi, was housed in the halls of Palazzo Barberini until Protected content , when it passed to the Corsini of Florence. For the first time, the exhibition is compared with the replica made in Protected content Agostino Masucci , left in via della Lungara and created for the mosaic version commissioned by Pope Clement XII, the century Lorenzo Corsini, for the altar of the family chapel in San Giovanni in Laterano Protected content , both with the painting preserved at the National Art Gallery in Bologna, by Reni himself, which portrays the Saint in other movements. This last work will come on display after a careful restoration financed by the National Galleries Barberini Corsini. The work from the Uffizi is a paradigmatic masterpiece of seventeenth-century devotion, with references to Raphael and the Old, in an alternative formula to the more thundering Baroque by Bernini and Pietro da Cortona. After a confrontation with Caravaggio's naturalism, Reni then moves towards a more and more rarefied painting, arriving in the last years of his career with precious chromatic agreements, of lilacs and oranges, such as those that can be admired in his second interpretation of Sant 'Andrea Corsini , later than ten years. The technical experimentalism of Reni, a painter who worked both on fresco and oil, on canvas, copper, touchstone and even on silk, will be analyzed in the second section of the exhibition. Already from the first half of the seventeenth century and throughout the eighteenth century his works, as seen with Masucci, were replicated in mosaic and tapestry. From Palazzo Barberini arrives the Sleeping Pesti of Reni to fresco detached from the wall and still provided with its frame made to perform specially by Cardinal Francesco Barberini in Protected content , which attests the exceptional collecting fortune of the master, and the particular predilection that for him had the Barberini . On show you can also admire the mosaic version, by the specialist Giovanni Battista Calandra, of the Portrait of cardinal Roberto Ubaldini executed by Reni and the mosaic Sibilla Persica , today belonging to the collection of Palazzo Pitti in Florence, attested in the eighteenth century in the building of via della Lungara. It is a masterpiece by Mattia Moretti who also worked on cartoons by Masucci, for the mosaics sent to Portugal. For the occasion, an illustrated catalog will be published, published by Officina Libraria, with texts by the curator. 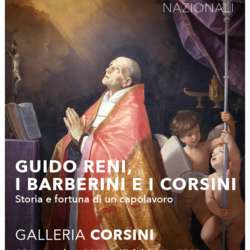 EXHIBITION: Guido Reni, the Barberini and the Corsini. History and fortune of a masterpiece.